As they flew over the flood area to drop food, Harry Jopson and the Piper Cub pilot would likely have seen scenes like this one in Stokesville. 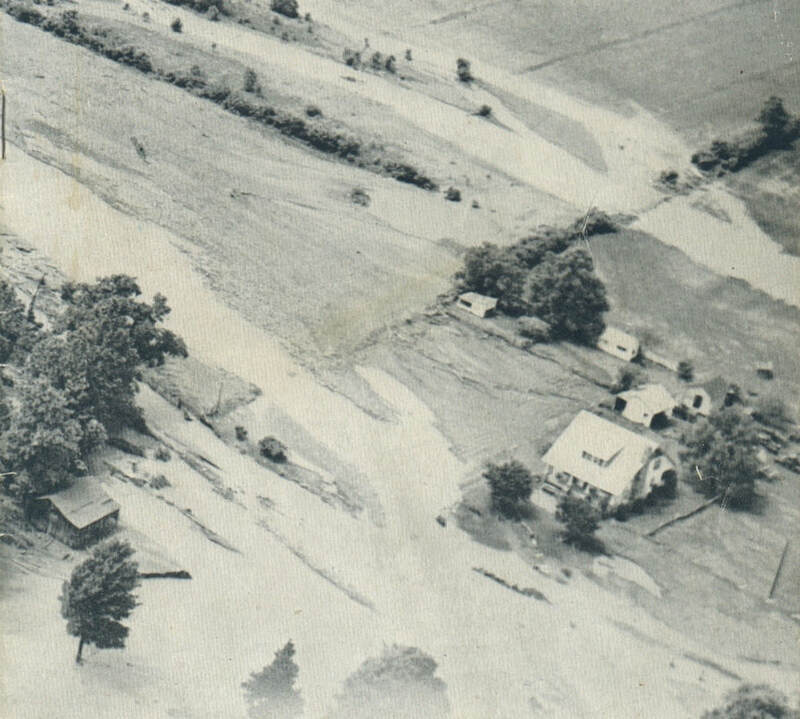 Photo from cover of Flood of June 1949 in Stokesville-Bridgewater Area. Virginia Department of Conservation and Recreation. 1949. ​The rain continued through Friday, one thunderstorm after another. On Friday afternoon, Harry decided to leave his lab at the college and go check on his hunting group's cabin on Tilman Rd. near Briery Branch. As he drove out to the cabin, he could see the rivers were flooded, and people were out of their houses watching. After supper, the lights went out. Harry and his hunting friends decided to go back to Bridgewater, but by then he couldn’t get near the bridge over Briery Branch. There was really no passage from the cabin except to walk across Narrowback Mountain, which they did. They hiked to a farm on the eastern side of Narrowback and were airlifted out, one at a time, in a Piper Cub, whose pilot was delivering food and water to marooned flood victims. Harry assisted in dropping food out of the airplane. He recalled that the pilot landed in someone’s yard, right in front of their house, to make a drop-off. From the air Harry had a bird’s eye view of the flooded Valley below. At Natural Chimneys, the North River was 200 yards wide. Many homesteads were flooded and needed food. The approaches to bridges were all washed out and people were stranded. Their rich topsoil of fertile farms was washed away, leaving fields that would never be as productive again, some covered by cobbles. Leslie Bulken recalls that many Bridgewater residents were not affected by the flood and were able to help those who were. There was much work to be done to restore homes and clean up debris. 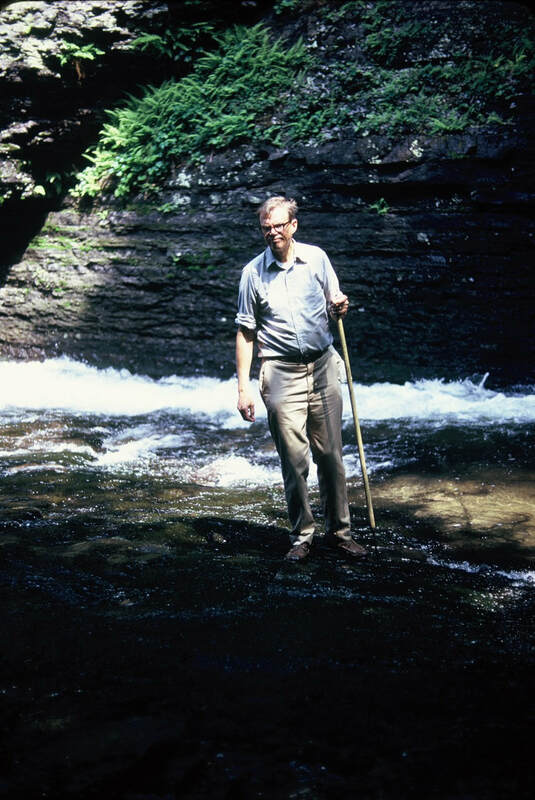 In the years after the Flood of 1949 Harry Jopson played a leadership role in advocating for flood protection by helping to form and chairing the North River Land and Water Conservation Association. The Association collaborated with state and federal agencies to fund and build dikes and reservoirs on the tributaries of North River. Prior to the flood, Staunton Dam was the only reservoir on Shenandoah Mountain tributaries. Now there are 10 reservoirs. 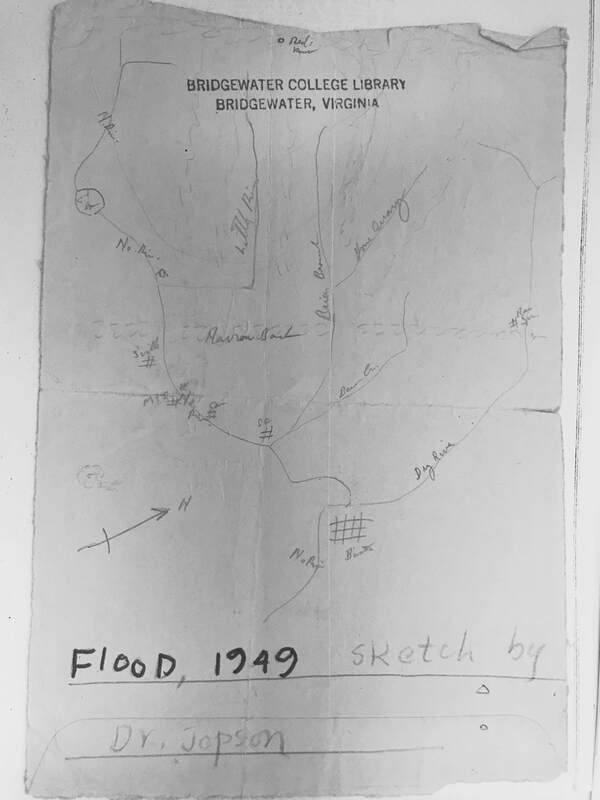 Drawing of flood area by Harry Jopson. Courtesy of Bridgewater College Library Special Collection. Used with permission. "Betty Bricker is Rescued after Clinging to Tree", Daily News Record, 19 June 1949. Bulken, Leslie. Telephone interview. 13 June 2018. Jopson, Harry. Personal interview. 16 July 2008.